When you share your location, your friends can start following your location immediately and easily share their locations back with you so that you are both in the loop. If at any time you do not want to be followed, you can hide your location with a single switch. Find My Friends lets you set up location-based alerts that can notify you automatically when a friend arrives at the airport, a child leaves school or a family member arrives home safely. You can also set up alerts to notify friends about changes in your location. When you use Find My Friends, your location can be shared from any of your iOS devices, allowing you to choose the device you have with you most often. If you have a cellular capable Apple Watch, Find My Friends will even switch your location to your Apple Watch whenever you are away from your iPhone. 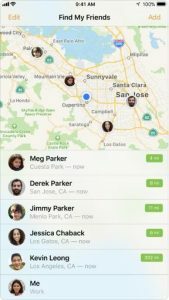 Find My Friends Version 7.0 requires iOS 11 or later and iCloud. You can create a free Apple ID to use with iCloud on your iPhone, iPad, iPod touch or Mac.